Go racing & entertain your clients with one of our business corporate hospitality horse racing packages. Hospitality deals at all the top UK horse racing venues, with stable tours, quality food and entertainment. "A day at the races will never be the same after you have been with SportsDays.co.uk"
Horseracing has been closely chronicled for longer than any other sport and, more than 450 years after the first recorded race meeting, it still provides one of the most glittering and colourful spectacles in any arena. All around the world, the legacy of the 17th century British aristocrats who shaped modern racing in Britain is a global industry with a thrilling shop window. From the ruggedness of the winter game, to the happy informality of a summer afternoon, to the upmarket elegance of the major international festivals, racing moves with the seasons and although it is today the sport of Sheikhs rather than Kings the fascination remains the same. The magnificence and beauty of the Thoroughbred horse, the excitement of a winning bet, the skill of top riders and the historic and often beautiful settings make for an occasion where hoofbeats and heartbeats are intertwined. 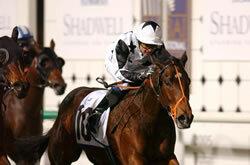 Sportsdays.co.uk director is a renowned Newmarket trainer. 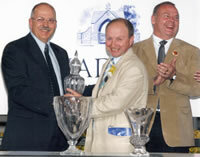 Conrad Allen has ridden and trained successfully in Newmarket for over 25 years. He still trains a small string of horses from his Hamilton Road base and combines his daily routine of exercising and training horses on Newmarket's famous Heath - with entertaining guests who wish to sample a "real behind the scenes experience" with a horse racing professional. Fresh from his success at The Dubai International Carnival with Prince Aaron (Ire) he is looking forward to sharing his this experience with his guests again this year. While you are with him you feel as if you are an owner and you are likely to mix with the racing people that you have previously only read about in the papers. Many guests are so impressed with their experience they come back time and time again. Top Jockeys and Trainers with runners on the day to visit your facility. Sponsor a race from £500. Name a Racehorse after your company, a product or even a loved one. If you are interested in finding out more about any of the above CLICK HERE or call 01638-666660.